ICOM IC-F8101 provides CCIR493-4 based 4-digit and 6-digit open standards Selcall, widely used in HF networks and HF calling systems. Supported Selcall functions include: selective calling, phone call, message call, position call, status call, emergency call and channel test call and the radio can be GPS tracked. Three types of controller confi gurations are available to suit almost any application or installation that may be required. Ideal for standard desktop use or quick set-up at a field station. Phone-style convenience for mobile operation in all types of modern vehicles. Get the proven ergonomics of a compact head and hand microphone with the separated RF unit. The built-in ALE system automatically selects the best channel and establishes a communication link. 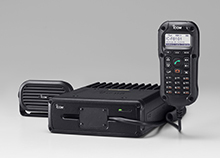 ALE provides interoperability with other 2G ALE radios using MIL-STD-188-141B and FED-STD-1045A ALE standards. ALE individual call, net call, sounding, AMD (Automatic Message Display) and LQA (Link Quality Analysis) polling are available. 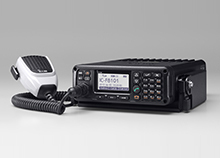 The IC-F8101 provides CCIR493-4 based 4-digit and 6-digit open standards Selcall, widely used in HF networks and HF calling systems. Supported Selcall functions include: selective calling, phone call, message call, position call, status call, emergency call and channel test call. For security, the owner passwordenabled stun feature can remotely disable the radio operation and the radio can be GPS tracked. IC-F8101 with optional MB-126. The IC-F8101 has a durable, enclosed structure securely sealed from the elements, in a stealthy black compact package. The IC-F8101 and the CFU-F8100 cooling fan unit has been tested to MIL-STD-810-G and IP54 ratings. Also, connection cables and connectors are IP54 water resistant. With the fanless design, you get 125W* output with full duty cycle operation in voice mode or in data mode a maximum 5 minutes of continuous transmission (25% duty cycle). When used with the CFU-F8100 optional external cooling fan unit, the IC-F8101 provides full duty cycle data and voice mode operations for absolute reliability during long continuous transmit cycles, or for operation in hot climates. * 100W for Australia versions. Optional CFU-F8100 fitted to the rear panel. You can check the transceiver’s internal condition by using the BITE capability. Auto, logic, receiver, and transmitter are checked. at the bottom of the display The IC-F8101 is designed for simple, straightforward operation. The Administrator/User feature can limit the functions that are accessed by the User. The Administrator can enter the operating frequency and assign memory channels from the front panel or the remote control microphone. The following functions can be assigned to the [I], [II], and [III] soft key buttons: Main menu, Manager menu, Set mode, Selcall address list, RX history, and TX history. The clear talk function separates signals from noise using the DSP, and gives you clearer audio at the touch of a button. 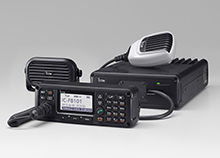 The IC-F8101 has 3 types of mute functions: call squelch, S-meter squelch and syllabic voice squelch. Call squelch opens the squelch only when receiving a Selcall or ALE call sent intentionally to this station and provides quiet standby. The latest DSP technology improves both the transmitter and receiver performance. The digital IF filter provides flexible filter settings for narrow band signals. 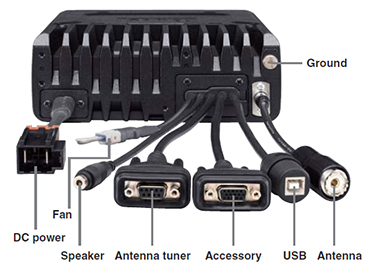 Optional UX-248 When connected to the UX-248 optional GPS unit, the IC-F8101 can send current position data to other stations and can be used with a AVL (Automatic Vehicle Location) system. The IC-F8101 has an internal expansion slot for an optional RapidM TC4 HF Data Modem Module*. This provides HF e-mail capability when a PC is attached. * A third party product. 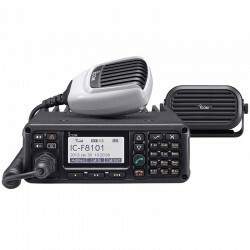 The IC-F8101 can be connected to a PC through a USB port for HF e-mail, CI-V remote control and modulation input. Icom makes rugged products that have been tested to and passed the following MIL-STD requirements and ingress protection standards. Tested to IC-F8101, AD-119, CFU-F8100 and MB-126. Tested to IC-F8101, AD-119 and CFU-F8100.